Wales star Gareth Anscombe has announced a shift from Cardiff to Ospreys. Gareth Anscombe has ended weeks of speculation about his rugby future by staying loyal to Wales. But the Kiwi playmaker who was a star of the Six Nations grand slam has confirmed he will move from the Cardiff Blues to Ospreys for the next northern season. 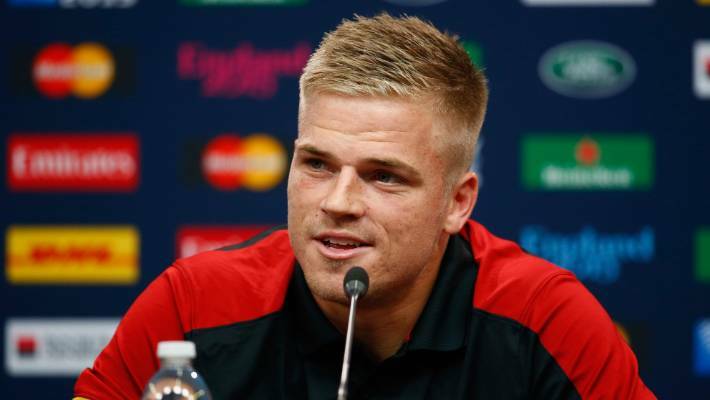 Unhappy with his pay situation, there were strong suggestions Anscombe could move to England, France or Japan though that would come at the expense of his Wales test jersey and a place at this year’s World Cup in Japan. Both of those are now secure and the 27-year-old is happy to have the next phase of his exciting career secured. The shift to Ospreys will ensure more time at No 10 than in Cardiff where he was regularly used as a fullback. It also brings him back in touch with Matt Sherratt who has helped shape his career in Wales since shifting north from the Chiefs in 2014. Anscombe has taken over as Wales’ first-choice first-five and wants to concentrate on developing his skills there. “I’m delighted to have secured my future to play professional rugby in Wales and to be joining the Ospreys,” Anscombe said in a statement as his Ospreys deal was confirmed. “I am very happy to finally be able to put pen to paper during what’s been an unsettling time and commit to staying in Wales. “I know a lot of the boys from my time with the Wales team and they can’t speak highly enough of the spirit and ambition within the region which really excites me. Ospreys head coach Allen Clarke said: “Gareth is a player I’ve admired for a long time and I’m delighted that he has committed his future to the Ospreys. “It’s not just a statement of intent, it’s adding another player of current international quality to our squad for next season, the number one player in Wales in his position. “He’s worked closely with Matt Sherratt previously and I know that Gareth is looking forward to linking up with him again both in terms of the challenge and quality development of his game.